Toulon head coach Bernard Laporte expects Wales full-back Leigh Halfpenny to remain with the French club beyond the end of the season. Halfpenny's current deal runs out in the summer and Cardiff Blues and Wasps have been linked with him. But Laporte said the 27-year-old will take up the option of a third season with the European champions. "He's staying at Toulon. I don't know when he will sign but it should happen," Laporte told AFP. "He's a good lad, you need some like him in a club. He trains five hours a day." 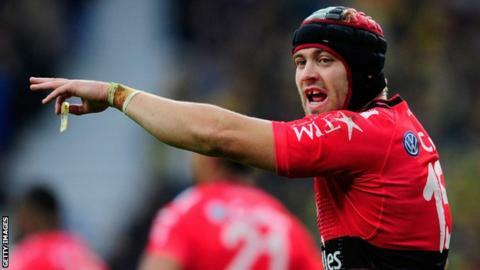 Halfpenny signed a two-year deal when he agreed to join Toulon from Cardiff Blues in January 2014. Former France coach Laporte said Halfpenny had been "under pressure" from his national coach Warren Gatland to return to Wales. A return to Wales would benefit Gatland given the limitations imposed on him on the number of foreign-based players he can select in the squad. But Halfpenny would still be eligible under the so-called 'Gatland's Law' as he would be taking up the option of a third season at Toulon on a contract he signed before the selection criteria came into effect. Former side Blues expressed an interest in re-signing Halfpenny while Scarlets said they would be keen to take him back to Wales. Wasps were also interested but director of rugby Dai Young said the Coventry-based club were "not an option" for the Wales full-back. The British and Irish Lions full-back has not played for Toulon this season after suffering a serious knee injury in a World Cup warm-up game for Wales in September. He subsequently missed the World Cup and is expected to miss this year's Six Nations Championship after having reconstructive surgery.